I wanted to post more to my blog, but it's been over a week and I still haven't gotten back to it. Ugh! And there's no time right now to compose a new entry, but in the spirit of putting up something, I thought I'd post a link to an article I read recently that relates to one of my 7 "random" facts. Timely don't you think? Check out the ad at the bottom. Doesn't exactly match the article's content! So, I haven't stopped writing, I've just stopped blogging. But wyo tagged me, and I remembered: I have a blog! Maybe I should get back to it. However, since I've found a way to deal with all of the emotion and angst I used to describe here, I'm not sure what to blog about. I'll have to put some thought into it. Now on to wyo's tag. 7 random facts. Hmm...random. How can one consciously think randomly? Wouldn't you have to choose many facts first, say 100 or so, and then randomly select 7 of them? Sorry, I'm not going to do that. Coming up with 7 is going to be tough enough. Anyway, without further ado, here are the first 7 facts about me that popped into my head just now (and that I am willing to share publicly). 1. I can tie the stem of a cherry into a knot, using only my mouth. It is an innate ability, which I didn't know I had until I was around 20 and tried to do it for the first time. Bet you didn't know I was so talented! 2. I hate eating popsicles. I can't stand popsicle sticks. Something about them give me the creeps. And the thought of chewing on one (which I realize is not a necessary part of the popsicle-eating experience) is horrifying. It's like nails on a chalkboard to me, and I have no idea why. 3. I like rats. Well not wild rats, but pet rats. My kids have two and they are so sweet and friendly, with such cute personalities. Several times last year when I walked my daughter to school, I brought the rats, who sat on my shoulder or hid underneath my sweatshirt. I'm not sure if any of the other parents noticed since I was avoiding eye contact and trying to decide if carrying two rats on the walk to school made me a cool mom or just a weirdo! 4. I have a very young-sounding voice. I'm 37 and sometimes when I answer the phone people still ask me if they can talk to my mom or dad. My daughter's gymnastics teacher thought I was her when he called our house. She was 7 at the time. 5. I went to Australia in May. My husband and my kids didn't go; it was just me and my dad. I loved Australia and I loved having that one on one time with my dad, but I hated being so far from my family for so long. Although, I did read more books over those 10 days than I had in months! 6. I went to Europe in June. Yes, I'm not kidding. I left for that trip 9 days after coming back from Australia. This time the whole family went. It was an amazing experience. 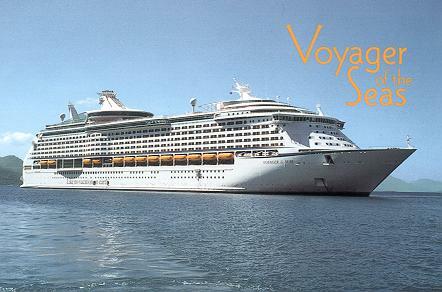 We cruised the Mediterranean on The Voyager of the Seas. This was my first time on a cruise and my first time visiting Europe. I highly recommend both. 7. International travel is not typical for me--I swear! Although considering facts 5 and 6, it might not seem that way! Okay, now who to tag.... I'm supposed to tag 7 people. Do I know 7 people who blog? I don't think so. So I'll go with 3. Cindy, because even after all this time, she still remembers me! Susan, since I have such fond memories of our ride back to the airport together after Surrey, plus I was thinking about her the other day when I drove past the exit that leads to the town where she grew up. And Karenna, since the last time I had to tag someone, I tagged her and she wasn't blogging then, but she's blogging now! That's the best I can do--but it's better than nothing, right? Oh, and can I say I hate this new version of blogger's spell check? Talk about not user friendly!